ABBEY MUSIC offers excellent lessons for your little 2-7 year old. They will have fun singing, learning rhythm, and playing with many instruments. 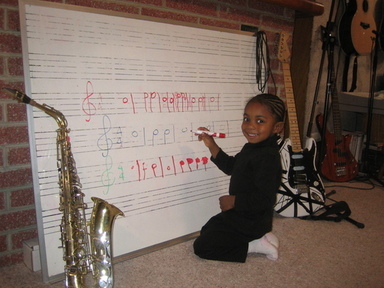 As they grow they will learn new and exciting musical lessons that will carry with them for their whole life. "Trinity was 2 1/2 when she started and has been taking lessons for 2 years. She has had great improvement in her music ability! She sings louder and knows the notes and how many beats they all get now." "The teacher is very good with her and has patience and understanding of what it takes to make her a good musician. She learns on the keyboard, drums, and guitar and loves them all." "The teacher is very good and I was lucky to find a person who offers a program for such young children. I would recommend Abbey Music to anyone. Trinity memorized all of the parts of the guitar and the string names." "The studio is what a studio should look like with all of the instruments available to the students. I could go on and on, but you should enroll and find out for yourself." Music is for all ages and especially for your little ones. 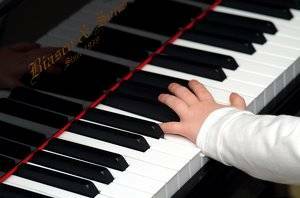 ToddlerMusiK can help your son or daughter develop excellent learning skills. Skills that will help them in school and in their other activities. ** scores higher on reading comprehension tests. ** improves spatial-temporal reasoning (like sequencing and visualization) scores by three times. ** experiences a two-fold increase in self-control. This increased self-regulation is crucial to all other types of learning because children can wait their turn, listen to directions, and allow other students time to speak. See the research for yourself and help your child to excel in all areas including math, literacy, and social-emotional development.